Product prices and availability are accurate as of 2019-04-19 07:14:51 UTC and are subject to change. Any price and availability information displayed on http://www.amazon.com/ at the time of purchase will apply to the purchase of this product. Conveniently and elegantly store your favorite bottles of wine with Sorbus Bordeaux Chateau Wine Rack! This creatively designed wine rack conveniently holds up to 23 bottles of your favorite wine. Each wine bottle is stored horizontally ensuring both the wine and the air bubbles are in contact with the cork. Keeping corks moist enables wine to stay fresh longer until you're ready to enjoy. It is made of durable construction and strong castings for long-lasting use. The entire wine rack is purposely designed with a sleek and chic look to accent any home, kitchen, dining room, or wine cellar. The black coat finish gives a touch of refined elegance from the old French Quarter. 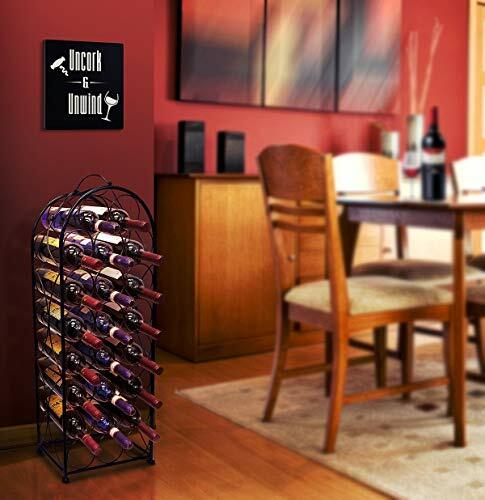 Adorn your most prized bottles of wine while creating the most useful and convenient storage! This arched, free-standing wine rack also makes a great gift for that wine aficionado in your life or for any special occasion. 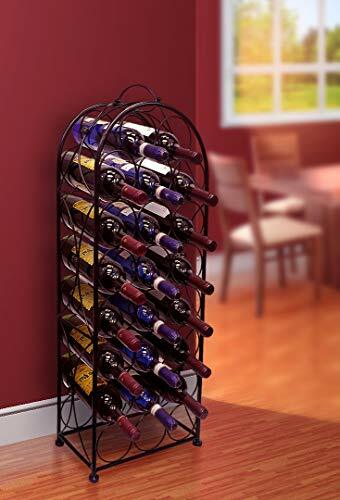 This wine rack can be easily cleaned with a dry cloth for lasting quality years of use. No assembly is required. It measures approximately 7"x13"x34" and holds most standard wine bottles wine bottles. Arched, free-standing wine rack stores up to 23 bottles of your favorite wine Constructed of durable metal that holds each bottle horizontally to keep wine fresh longer until you're ready to drink Elegant design to accent any home, kitchen, dining room, or wine cellar Great wine rack to store or start any wine collection - Also makes a great gift for any special occasion No Assembly Required - Can be placed right on floor and has a handle for easy portability - Holds most standard wine bottles and measures approximately 7"x13"x34"